Nólsoy is a small island to the east of Streymoy, just a quick 20 minute ferry ride away from Tórshavn. We parked our car overnight in the free parking lot about 200m east of the port/Fort Skansin since no car is needed on Nólsoy. There are no grocery stores or convenience stores or any kind. 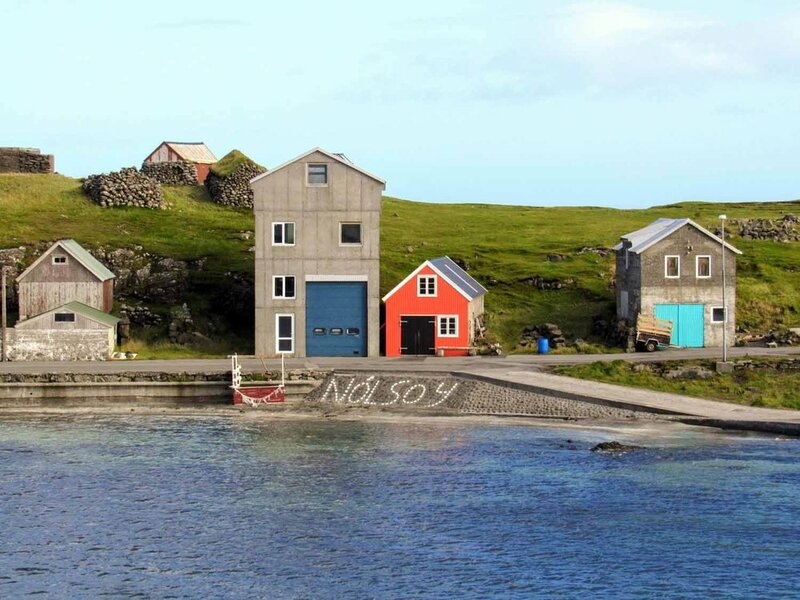 But what Nólsoy lacks in amenities, it makes up for in charm. The quaint, colorfully clad houses make for the perfect backdrop for an afternoon stroll through this tiny toy-like town. Most people come to the island to hike out to the Borðan lighthouse; however, it’s about 14 km long and takes about five hours to complete. We were short on time, so we only hiked partway and then we enjoyed a leisurely trail-side nap before heading back to town. Whatever you do, when you go to Nólsoy, you must make a stop at the island’s only cafe/bar, Maggie’s. Maggies is unlike any cafe we’ve ever been to before… mostly because it’s in someone’s basement and the homeowner also happens to be the bartender. It is decorated with portraits of famous UK musicians and offers karaoke for your entertainment. The Faroe Fish N’ Chips is the dish to get and most likely, the local drunkard at the bar will have caught it out in the bay earlier that day. For us, this was the case. We stayed at one of the few Airbnb’s available on the the island. Our host was from Iceland and came to work on the Faroes to work a summer job pulling weeds at a local cemetery. The Faroes are known to get their fair share of rain and coastal weather. That summer had the highest rainfall in years. She admits, it was quite miserable, but meeting her future husband on her first day of work made things more bearable. Her husband, a German, had been on a cruise with his former fiance and due to bad weather, they had to make an emergency stop at the Faroe Islands. Previously, he wasn’t aware the Faroe Islands existed and afterwards he never left (largely due to his sea sickness). How do you emergency-land on an Island you didn't know existed, never leave, and marry someone else than who you arrived with?! Only in the Faroes. The Tórshavn - Nólsoy ferry is a short ride across the bay to the island from the capital city. We parked our car overnight in the free parking lot about 200m east of the port/Fort Skansin since no car is needed on Nolsoy. a pervasive and irrational fear that you are being watched by a duck.